It’s that time of year again. Back to school is both fun and stressful when you are the teachers trying to do #allthethings. 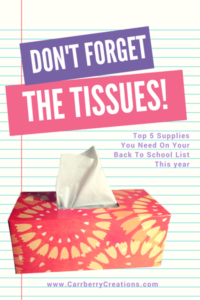 Let’s me help you cross off 1 thing by sharing with you my 5 favorite school supplies for my back to school shopping list. 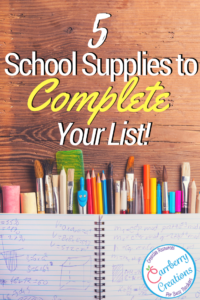 * BONUS* I’ve included a link to a editable school supply list you can send home with students this year! Please be advised that this post contains Amazon affiliate links. Clicking on these links and making purchases from amazon.com earns CarrberryCreations.com money for our operating expenses. 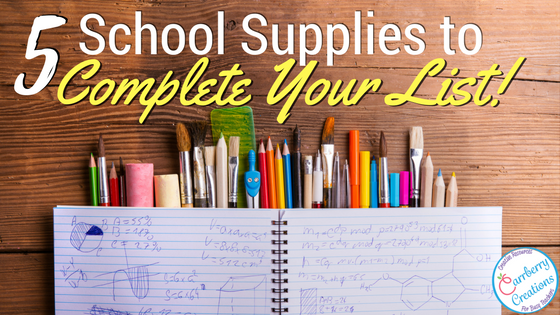 It is easy to remember to ask for the usual pencil, crayons, and notebook paper from parents. A great school supply to add to your list is boxes of tissues. You can never seem to have enough so generally the list I send home to parents includes 3 boxes of tissues. They get stored on shelves and above cabinets all around my room, but when cold and flu season comes around I am seriously glad I remembered to ask for them. Something that I have found over the years to calm agitated students is a calming piece of art. Anything that you can flip over and watch things shake or slide down slowly can be very soothing to students who are feeling a bit over stressed. I love to try to add a new piece to my classroom each year and then cycle them through to keep students interested. They come filled with sand, glitter, or gel. I have found them in local shops, tourist destinations, and there is a nice selection of them that you can find on Amazon. The one pictured is plastic rather than glass, making it safer for around children which is something you may want to consider. Make any paper and pencil activity re-usable by placing them inside a sheet protector and and having students write on them with a dry erase marker. This works great for handwriting practice, fine motor skills practice, and sharing the back of favorite magazines and cereal boxes. I have also put plain or fun colored papers in them to have students use as dry erase boards during small groups. These are a very inexpensive and versatile addition to your list of school supplies. I know that the sign outside my classroom says my classroom runs on love, laughter, etc…. Let’s face it, if I’m going to be honest, my classroom runs on lots and lots of coffee. My school has a coffee pot, tea kettle, and k-cup machine in the staff lounge, because teachers run on coffee. I always make sure to stock up when I find a good sale. This chime is by far one of my favorite school supplies. I picked one up 3 years ago and I could never part with it. I use it to signal the class to attention, and transition students during small group rotations. It comes in multiple sizes and many of my coworkers have the single chime model. My students and I love the three chime version and some years they have even really gotten into the idea of having each tone be the signal for a different direction. It is loads of fun and helps keep a soothing tone in the classroom throughout the day. Do you need a fun sheet to type out your supply list on? 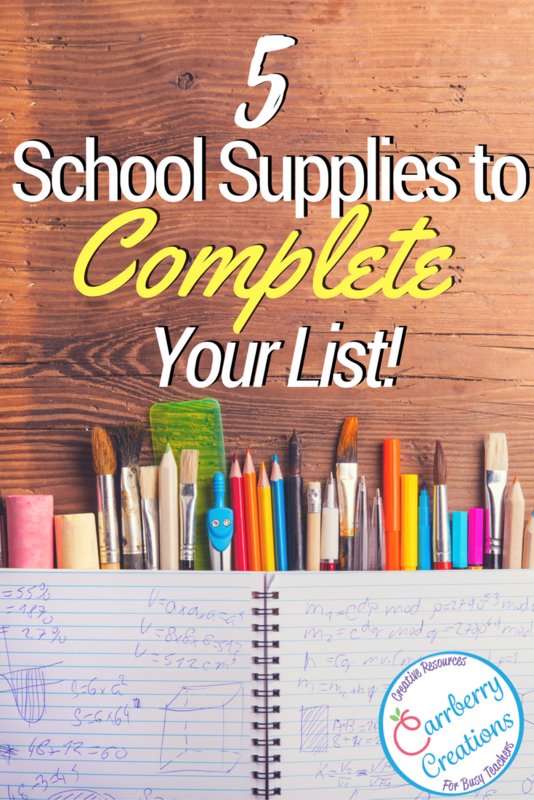 Just click on the image below to download a copy of my editable school supplies list. This file is in Google Slides format and will prompt you to make a copy. You will need a free Google Drive sign in to download this file. Enjoy! Mary Carr of CarrberryCreations.com is a participant in the Amazon Services LLC Associates Program, an affiliate advertising program designed to provide a means for sites to earn advertising fees by advertising and linking to amazon.com.